WHY: SB 196 would roll back a 2017 law protecting student privacy and parental rights. Instead of giving parents the right to “opt-in” before a non-academic survey is administered to their children in school, it would switch to an “opt-out” policy – meaning that if a parent doesn’t actively say NO, the school will administer the survey to the student. Read Cornerstone’s written testimony here. Contact your State Senator to overturn the committee recommendation of “ought to pass with amendment” and instead vote INEXPEDIENT TO LEGISLATE. WHEN: Committee Work Session Tuesday, February 12, 10:00 a.m. Legislative Office Building in Concord, room 204. WHY: Enabling widespread use of recreational marijuana brings social, economic, and health costs that far outweigh any benefit the state might derive from taxing the drug. Read Cornerstone’s testimony on the bill by Neil Hubacker, our Director of Strategic Alliances. CORNERSTONE POSITION: Cornerstone SUPPORTS the bill and recommends an “ought to pass” vote by the full House. Read Cornerstone’s testimony on the bill. WHY: With abortion in New Hampshire virtually unregulated, public health authorities are not monitoring even the most basic data about the procedure and the people affected by it. It’s time to join the 47 other states that recognize abortion statistics as a matter of public health. 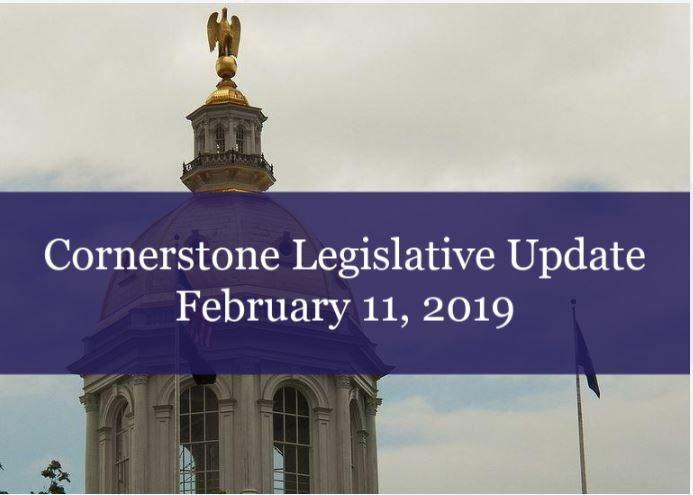 WHAT YOU CAN DO: Watch Cornerstone’s legislative updates and Facebook page for news on when the bill is scheduled for a House vote. WHY: The bill lacks clarity about what constitutes “discrimination.” More analysis to be forthcoming. CORNERSTONE POSITION: Cornerstone recommended that the bill be AMENDED to add recognition of religious liberty rights of students and teachers. A majority on the House Education committee chose to recommend killing the bill, rather than consider amending it. WHY: Read Op-Ed from Cornerstone Attorney Christopher Jay. WHAT YOU CAN DO: Watch for Cornerstone’s report when the bill is scheduled for a House vote. STATUS: Still in committee (House Ways and Means); so many people came out to support the bill at its first hearing that a second session will be scheduled, probably in March. WHY: The education tax credit law funds school choice scholarships that benefit hundreds of New Hampshire children from low- and moderate-income families. Repealing the education tax credit would harm those children. Read Cornerstone’s written testimony here. The House Criminal Justice and Public Safety Committee voted to retain HB 201,This means the bill will not go to the House floor until 2020. By refusing to take an up-or-down vote on the bill, committee members missed a chance to enhance protections for children. Cornerstone will continue to support the bill, and with many anti-trafficking allies, we’ll be watching for what the committee and the House do with the bill next year. Read Cornerstone’s statement on the committee vote to retain the bill! Cornerstone’s response was covered by the New Hampshire Union Leader.